The Berry Burst slot machine from Netent is one of those super-simplistic offerings that really just works. It doesn’t rely on fancy cinematic effects or overly complicated bonus features. Just classic slot machine conventions given a slightly modern touch. The game uses a cluster pay format rather than relying on strict win lines and this further enforces the simplistic gameplay which some folk will love, and some will find gets old very quickly. Brightly coloured, well-designed, feel good machine. These factors will certainly appeal to many slot players. Simplistic gameplay. What you see is what you get. You won’t need to understand loads of bonus features. Just load it up and hit spin! Great soundtrack. You’ll feel like you’re in Ibiza on a sunny afternoon with this light, dance-inspired classic! Unless you’re a fan of this style of machine, you’ll likely find the lack of features incredibly boring quickly. There is only so long some folks can stare at fruit segments without craving a bit of action! Raspberry =5,000x the total bet. Orange = 3000x the line bet. Grape or Lime = 2,500x the line bet. Heart, Diamond, or Spade = 1,000x the line bet. A symbol forms part of a winning cluster if it is horizontally or vertically adjacent to the same type of symbol. When six or more “Wilds” form a cluster, they will only substitute for symbols on either side of the cluster. Due to this, the only time that “Wilds” can form a cluster and do not substitute for a symbol on either side of them is when the whole screen is filled with “Wilds”. One or more “Wild” symbols landing anywhere on the reels during the main game will automatically expand to cover the entire reel they land on. They then activate a Re-Spin. When the Re-Spin ends, any new “Wilds” appearing on the reels expand in the same way as the initial spin and the wins are calculated. 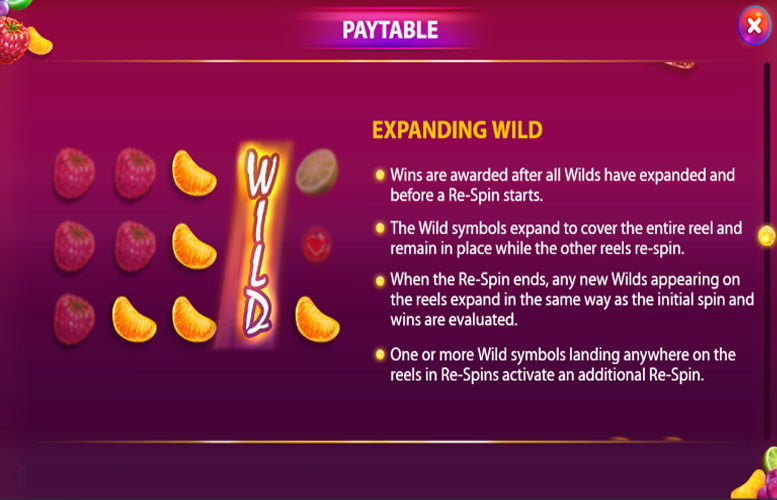 One or more “Wild” symbols landing anywhere on the reels in Re-Spins will activate an additional Re-Spin. 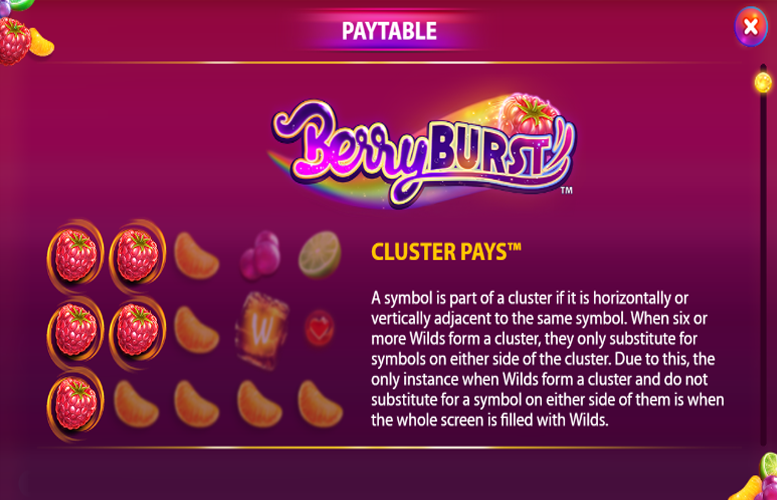 There are no actual win lines on the Berry Burst slot machine from Netent. However, to work out how bets are placed across the reels, it plays as if there were 10 lines. 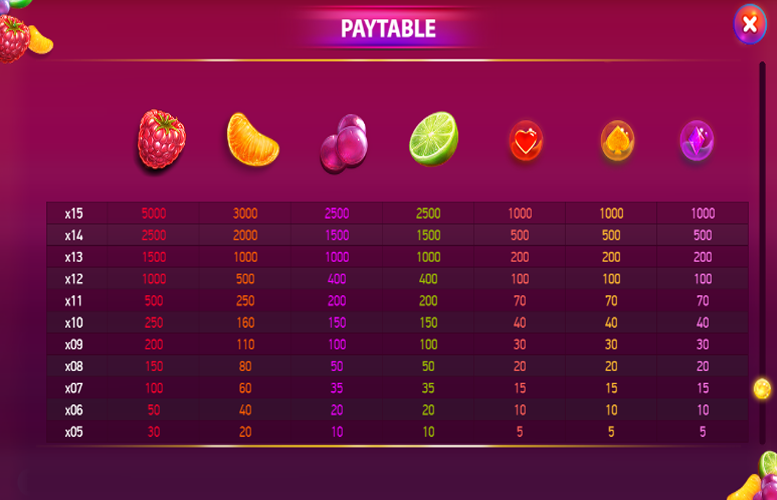 Players cannot adjust this number but can choose between one and ten coins to bet on each supposed line, as well as the value of each coin bet. Here the values range between 1p and £2. This means when all values are maxed out, the largest possible bet is an impressive £200. Meanwhile, with everything set to the minimum, players will spend just 10p per spin. The Berry Burst slot really does cater for all bankrolls. The Berry Burst slot machine will either be everything you want from an online gambling experience or none of it. It lacks elaborate cutscenes, second screen bonuses, and flamboyant graphics, yet to the right players, it will be the perfect game. Its style is simplistic, but the gameplay is still fun, and many will find it a nice break from the super-intense, action-packed slots that are common these days. Despite its stripped back style, the Berry Burst slot is still a looker. The symbols are all well-designed and have a modern yet simplistic feel. 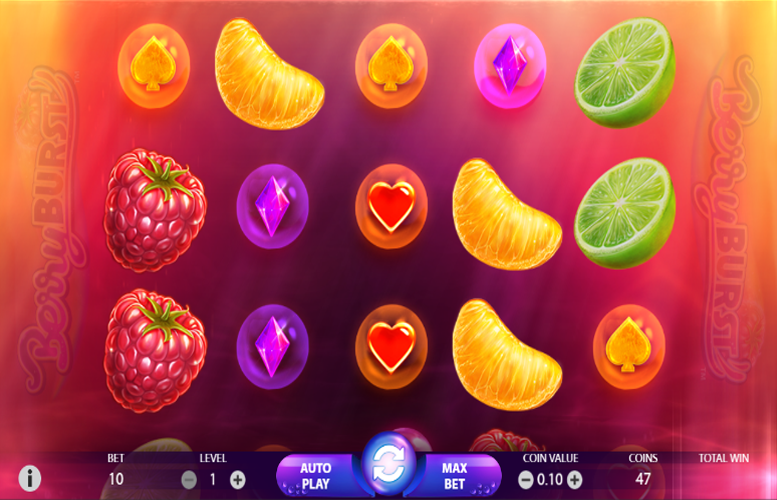 All told, if you’re a fan of basic slot machines or just want a break from your usual bonus-heavy machine, Berry Burst could be just what you’re looking for. This game has a rating of 4 / 5 with 643 total reviews by the users.